Which game did you miss in 2017 that you're saving for the holidays? We have all the time in the world now. It's the PC Gamer Q&A! Every week, our panel of PC Gamer writers ponders a question about PC gaming, before providing a short and informative response. This week: which game did you miss in 2017 that you're saving for the holidays? We'd love to hear your answers in the comments below, too. I enjoyed Regency Solitaire, which was Grey Alien's previous reskinning of solitaire as a Jane Austen-style period drama. And I liked Faerie Solitaire too, which was a different studio called Subsoap basically reimagining solitaire as a cute Popcap game. What I'm saying is, if you can turn playing cards by yourself into some kind of saga then I am your audience. But I didn't even get past the tutorial of Shadowhand before I had to put it aside and play other things I needed to write about more urgently. From what I saw it's a more thorough twist on solitaire than they've tried before, one that uses it as the randomizing factor for RPG combat in the same way other games use dice. You play a highwaywoman, and there's swashbuckling, romance, and pirates involved. In a way it reminds me of a tabletop RPG called Castle Falkenstein, which also used cards instead of dice and a period setting where people said "indubitably" with a straight face. I'm looking forward to giving it a proper chance when I can play it on a laptop balanced on my stomach which will be full of Christmas ham. I've been trying to find the time to play Night in the Woods all year. I definitely have some pent-up feelings about small town America (and maybe a latent fear of having to return to it one day), and a smart, funny game built around that setting is something I know I'll love. Earlier this year my girlfriend and I played Oxenfree together and had a great time, so I've had Night in the Woods pegged for our next game. We just never got to it, and in October the developers announced an expanded version was in the pipe, so that felt like a good reason to wait. Weird Autumn edition is out just in time for the holidays, so I've got Night in the Woods pegged for a post-Christmas game. I can't wait to laugh, and also probably be a bit depressed. When it comes to survival games I tend to overdo it, playing a bunch of them in a short period of time before getting so sick of chopping down trees and cooking at campfires that I can't bear to play another one for months. Then, eventually, I get back into them again for a while. The first time I played The Long Dark, then in Early Access, I was at the tail end of storm of survival games and I bounced right off it, unwilling to mope around freezing and starving and wondering where my next meal would come from. It left Early Access this year, and I would like to finally give it a proper look. Maybe when my belly is full of Christmas ham and my feet warm in new socks, I'll finally be in the right mood to put some real time in it. I didn't exactly miss it—I was actually down to review it at one point—but various other features conspired to move Okami out of my grasp when the HD version came to PC. I actually played it on console back in 2007 but hit a bug over halfway through rendering progress impossible but being unable to reset to a point before it had bugged. Faced with losing more than a dozen hours of progress, I couldn't face going back. About a decade later the irritation of that bug has abated just enough for me to consider returning to the inky world and trying all over again. Fail me again, though, wolf, and I'll be ditching you for Slime Rancher quicker than you can whip out a paintbrush. Since it was released, Wolfenstein II has been sitting unplayed in my Steam library, staring at me, wondering why I don't want to load it up and kill Nazis. So I reckon the holidays, when I have an abundance of spare time, is when I'll finally give Blazkowicz the attention he probably deserves. I didn't love the original, though, so I'm a little wary of this one. I hear it's difficult, and I don't have the patience for hard games these days. So we'll see how that pans out. If I can't get on with it, there are a dozen other games I didn't get around to playing. I've been abstaining entirely from digital cards for the past four or five months so I could dive elbows-deep into the new Elder Scrolls: Legends set, Return to Clockwork City. Thematically, it's focused on the mechanical creations of the Dwemer (and those who'd hope to steal from their ancient vaults), with a new singleplayer campaign and a bunch of new cards. Competitively its impact has apparently been a bit underwhelming, but I'm still looking forward to reacquainting myself with the meta. Unlike the FPSes I play, one of the things I've always loved about Magic: TG and other card games is that their landscapes can shift so quickly and dramatically, even as players simply discover new synergies. I mean, that's part of the business strategy. I like observing the shifts in "what's in style" on sites like betweenthelanes.net (co-run by the excellent TESL streamer CVH), picking out a new deck that suits me, building it, then modding it further based on my preferences. I'm not sure if this counts, since technically I've already put many hours into it this year, but Nier: Automata. I finished my first playthrough of the awesome action-RPG about robots with feelings earlier this year, but as (most) people know, the game has multiple (26, to be exact) endings and is meant to be replayed several times. I'm looking forward to starting my "route B" playthrough, but I've been holding off for the last few weeks, saving it for holiday time when I can really dive in. I'm one of the shameful few who never touched Cuphead on launch. It's not that I don't find the game appealing (I do), just that when everyone praised it at release I felt like I was at a breaking point in how many games I was trying to juggle and complete. Adding a excruciatingly tough boss brawler to that pile would have surely driven me to madness. But what are the holidays for if not bashing your head against something repeatedly, sinking into the depths of despair as you realize you can't succeed, and then drinking in the dark until the wee hours of the AM? Oh, I'll probably boot up the new Path of Exile expansion too because the new league sounds like fun. 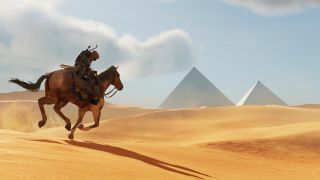 I've theoretically earmarked Assassin's Creed Origins as this year's 'big' Christmas game to wallow in. My worry here is that 1) each time I've tried to run it, it's had some pretty wild performance dips, and 2) I will almost certainly use these as an excuse to go back to Destiny 2 and grind for Masterworks weapons while watching old British detective shows. Last Christmas I ploughed through every Inspector Morse episode on the ITV Hub. That's a lot of dead professors. A question I can more confidently answer is what will I be drinking. And the answer is sweet sherry.